Shortly after 12:01am on Sunday, the Phillip Lim for Target Collection went live online. Online shoppers, limited to three items per order, snapped up the fashion designer’s skirts, sweatshirts, and tops, priced between $19.99 and $49.99 – quite the steal, considering the three-digit price tags on Lim’s usual wares. A few hours later, the Phillip Lim Collection bags – made from high-quality imitation leather, and all priced below $50 – became available, and the true frenzy began. In Target’s major metropolitan locations, shoppers lined up for hours before stores opened on Sunday, where they were allowed to enter in staggered groups. By the end on the day, many of the most desirable items were on eBay, and by Monday, there was hardly anything left. A success story like this takes a tremendous amount of marketing, some true customer obsession, the desire to build a fantastic customer and fan community, and some social media smarts. Target knows their customers, as their collaborations with prominent designers have shown. It may be a big box superstore chain, but Target is well aware that it shares a customer base with fast fashion retailers like H&M, Forever21, and TopShop – they’re working with a community of trend-conscious young people who are aware of high-fashion, working with limited funds, and who use social media sites like Twitter to communicate with both retailers and peers. But Phillip Lim wasn’t the first Target designer collaboration by far. Target has embarked on many of these capsule collections over the years, and has certainly had some bombs amidst the massive successes. What sets Target apart is their ability to listen to their customer community, particularly on social media, and pivot when things aren’t working out as planned. But soon after the Missoni line launched, social media turned against them. Fans were all over Facebook and Twitter – not to promote the line, but to complain. Thanks to the high traffic, Target’s overloaded server processed orders that it then either delayed or cancelled. Customers tweeted and posted their dissatisfaction, and the story of Target’s fail was picked up by fashion bloggers nationwide. From a financial perspective, the Missoni line was an enormous success for Target. 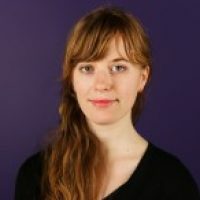 Many companies would’ve ignored a little bad PR from a handful of fashion blogs, or a few dozen negative tweets – the story was never picked up by a major newsource, and today, it’s hard to find any record of their blunder. But Target knew that they’d wronged some of their most important influencers – their customer community and the fashion bloggers. They knew that in the world of fashion, independent, unaffiliated, unpaid bloggers often have the most sway. Target publicly apologized for their mistake, issued full refunds, and sent additional gift certificates to their denied fans. When previously cancelled orders became possible to fill, Target shipped those items out free of charge. 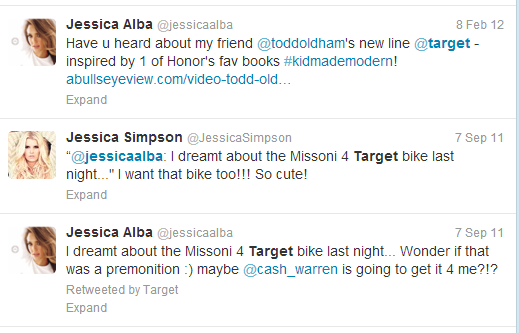 But make no mistake: Target had to earn their community cred the hard way, and it hasn’t always been easy. 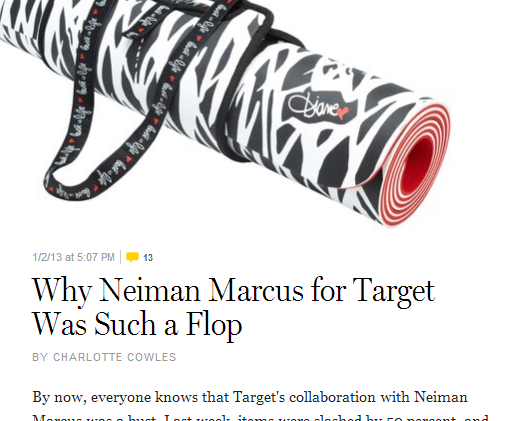 In 2012, Target tried a new approach to their collaborations, partnering with luxury department store Neiman Marcus. In response to influencer and customer feedback, Target bulked up their server capacities, and greatly increased the quantity of “limited edition” stock. But they also experimented with their formula: because Neiman Marcus houses a long list of brands, each featured brand created pieces tailored toward the Target audience. While previous Target collaborators had created affordable versions of their signature pieces, Diane Von Furstenberg (known for wrap dresses) made a yoga mat, while Oscar de la Renta attached his name to a dog food bowl. And what did the social media community think? Unfortunately, the collection was almost universally dismissed by the community of online fashion commentators. Previous collections sold out in days; the Target + Neiman Marcus collection was eventually discounted by as much as 70%. A month after their much-hyped launch, Target could hardly give the collection away. Regrettably, Target wasn’t listening to the needs and wants of their target market and customer community. On the heels of the Neiman Marcus flop, Target returned to their original equation with the Prabal Gurung collaboration in February of this year. They were now armed with new knowledge, fueled by social media interactions, about what their customers want – cohesive collections with known designers, and signature pieces that are in sync with that designer’s usual offerings. That brings us back to the smashing success of the Phillip Lim collection and the Target community that came together to help each other. 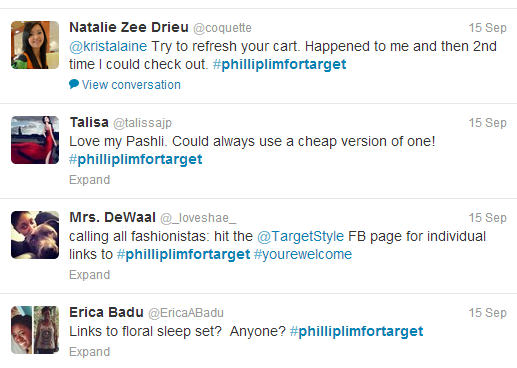 This past Sunday, only minutes after the Phillip Lim collection went live on Target.com, the hashtag #philliplimfortarget began trending on Twitter. Not just because shoppers were posting pictures of their new purchases – though there was plenty of that – but because frustrated customers were using the hashtag to troubleshoot issues with the site. Shoppers, eager to jump into the frenzy, had been confronted by error messages and “preview only” views of the collection. Using the hashtag to sync conversations, the fashion faithful eventually figured out that the site was rejecting mobile devices, tablets, and laptops – desktop users were happily loading up their carts. Target’s social media team may have tweeted the first #philliplimfortarget hashtag, but of the thousands of tweets that followed, only a few were from the @Target handle. A community of fashion bloggers, Phillip Lim devotees, and bargain hunters immediately began using the hashtag to identify and connect with one another. The amazing part? Target has successfully built an authentic, sustainable community that helps each other. This community has now connected with one another through a love of fashion at a bargain, and they have Target to thank. What are you doing to create a community for your customers?